Caprese never fails. This was one of the things I made for Italian week. It falls in the category of meals that is easy to make yet so yummy that it makes me wonder why I spend longer than 20 minutes making anything. Yes, my fear of flour and making dough from scratch is intact, so I turned to the dependable garlic naan to use as a base instead. 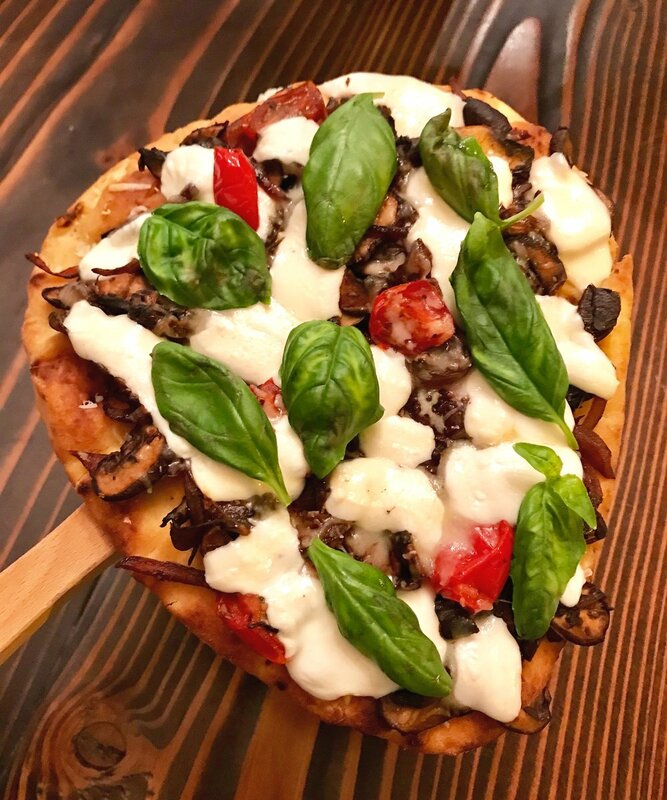 The truffle oil elevates the flavor of the naan, and the chipotle spiced mushrooms add a nice smokiness and texture to typical caprese combo. Preheat oven to 400F. Line a baking tray with foil, place naan on tray, and drizzle truffle oil on one side. Bake for ~12 minutes until the naan is slightly crispy. In a skillet, saute onions in olive oil. Cook the mushrooms and peppers with the onions until the mushrooms have released their water. Remove from heat and toss in cherry tomatoes. Spread the mushroom mix on the naan and add fresh mozzarella. Put naan back in the oven for a couple minutes until the cheese melts. Finally, top with fresh basil, drizzle a little extra truffle oil, and serve immediately.